Why Wait For Official Daredevil Toys When There's Great Custom Figures? If you’re anything like me, the moment you finished tearing your way through Daredevil on Netflix, you wanted a little Matt Murdock for your toy shelf as soon as possible. 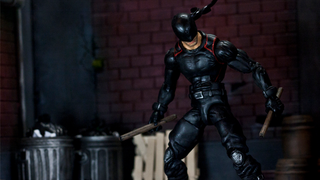 Although official Daredevil figures might be a long way off, the custom community is already making amazing figures to sell. Sadly already sold out, but what a great figure. I love the splash of red — the show suit has it but no where near as prominent, but it makes a toy’s look “pop” a bit more. Simple, clean, but still a great figure. Even better is that Glenn also posts breakdowns of his custom figures on Youtube, allowing you to see the creation process and just how many figure parts can go into creating a custom figure. I love toys, but I don’t think I have the bafflingly knowledgeably mind to be able to pick apart figures from different lines and just know how what would be great to use else where. WWE’s Kelly Kelly + X2 Wolverine + Longshot + Superior Spider-Man + Iron Fist = Matt Murdock? Who would’ve thought it? You can bid on it here if you want. So cool! Let’s hope Marvel, Hasbro, Funko et al can get on the Daredevil merchandise train sharpish — and lets hope they can do just as good a job as these amazing customs!